We are South East London Dads a social group and support network for dads and male carers in the local area. 2014 is our sixth year. Our informal group is made up of all kinds of dads, some full time home dads, some working full or part time. Our events and activities are open to all dads, grandads, uncles, male carers (sometimes partners too), and focus mainly on fatherhood from pregnancy, through infancy and early years up to school age. We hope you can come along, get in touch and get involved! considering taking on this role? Get in touch with us as we'd love to meet you and to offer any support or advice we can. SE London Dads received funding from the Co-operative Community Fund in 2010. 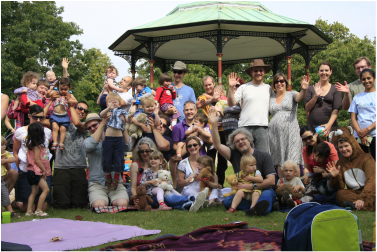 SE London Dads began as part of our local NCT (National Childbirth Trust) branches, and administratively we are a subgroup lof this charity. Our group is open to all dads and male carers, NCT members and non-members alike.